The new owner purchased this 3 story town home because he loved the layout and the construction, but he disliked the bathrooms, color selections and the loft-like industrial accents the builder installed , and so he started shopping for new a new look. He contacted Renowned Renovation based on a recommendation they received from the staff at the Ferguson Showroom in Dallas. The master bath had an awkward tub in the corner, 2 separate vanities, a small shower, and the toilet closed off in a small closet. With the aid of our interior design team we straightened out the bathroom, providing a simple, clean, and functional layout. And the 3 guest bathrooms got new vanities, faucets, lighting, countertops, tile floor, and new tile tub surrounds. 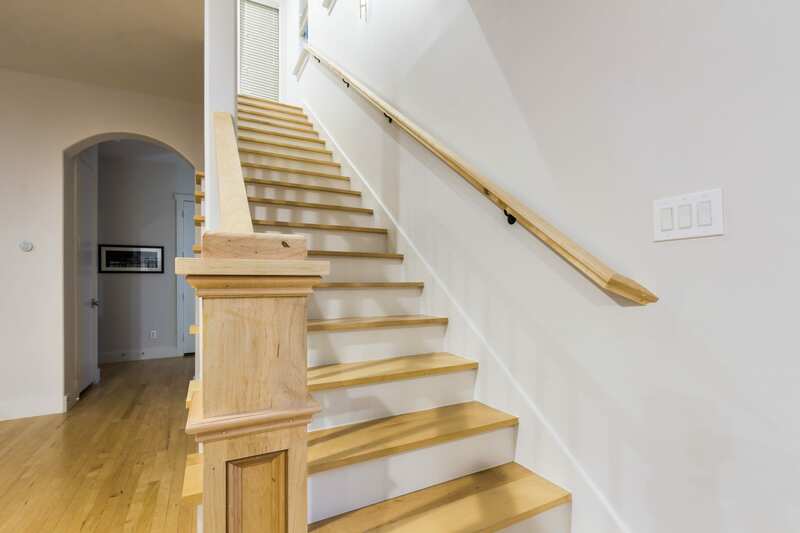 The existing stairs had a steel post & rail system, giving the home an industrial contemporary look. 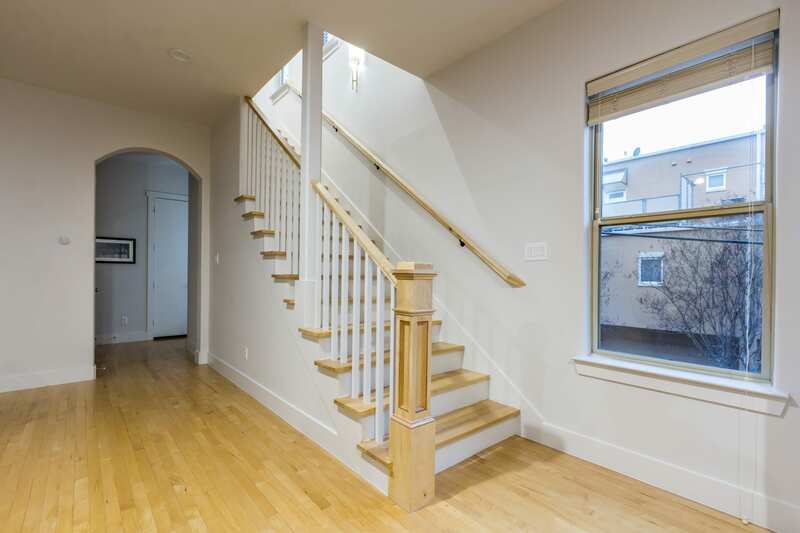 We added new wood post, maple railings matched to floor, and installed painted wood balusters that restored the arts & crafts, traditional vibe of rest of the home. 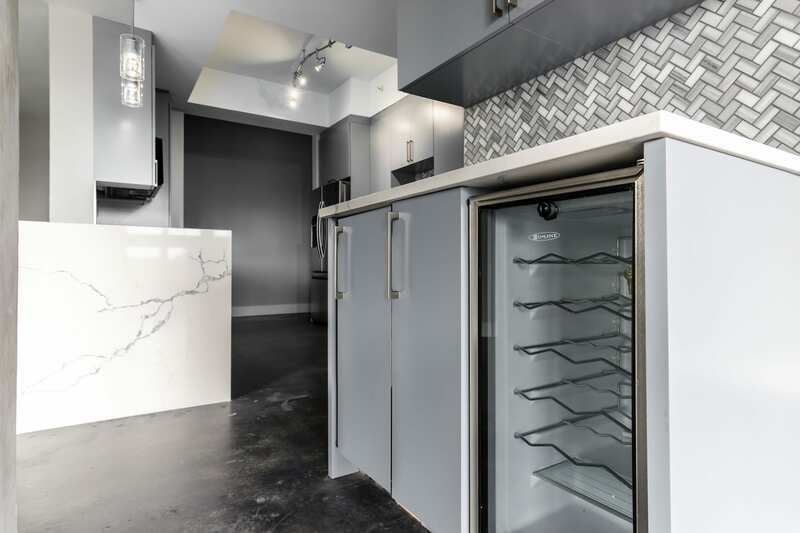 I hired Renowned Renovations to renovate my townhome in West Village – this is the first home I have ever owned as well as my first renovation project. When I purchased the home, I knew that I loved the layout but hated the finishings, so as soon as I closed, I immediately started looking for a contractor. Right away, I was impressed by Grant’s professionalism. After a few minutes of standard pleasantries, he got right down to business. We spent about a half hour walking through each room in my home, talking through what I wanted to do. Based on the walkthrough, Grant quickly turned around a detailed bid, and we started the project shortly thereafter using the bid as our project plan. In addition to the initial walk-through, I worked with Melissa on a number of aesthetic selections. 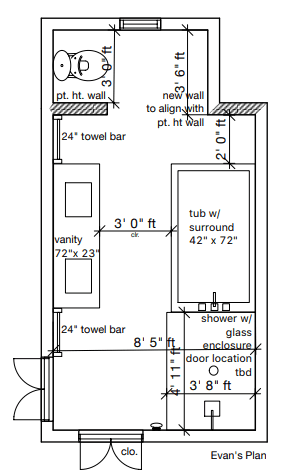 One area where Melissa played a crucial role was the layout for the master bathroom. I knew the existing layout utilized the space very poorly, but I had no idea how exactly to rearrange everything. Melissa came back with 3 options (one of which we moved forward with), and I know I would never have ended up with the design we landed on without her help. The kitchen cabinets were purchased at Lowe's and the countertops that we installed were selected from the stone collection by IMC - Dallas. We also installed a new fireplace working with Glen at Trinity Hearth & Home, Inc for help replacing it. The entire house was painted and new Tuftex Carpeting was installed through-out the home. This Condo at The Renaissance on Turtle Creek had not been updated since 1998. The new owners wanted a modern look with concrete walls and large stone tile. 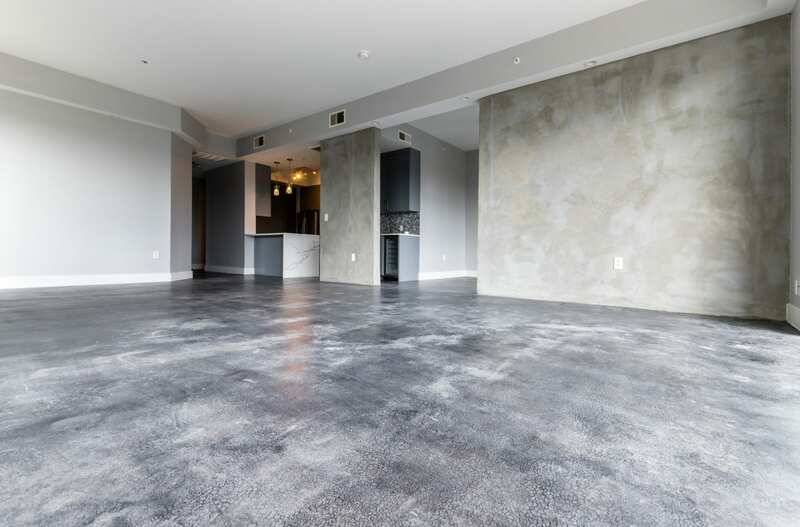 For an industrial look and to add more character to the space the flooring was stained a dark gray and the structural concrete walls are exposed to accent the floors. The walls were skim coated and then were sealed with a natural coating. The kitchen countertops are simple yet stunning featuring Statuary Classique Quartz from MSI Surfaces which is elegant, durable, and requires no maintenance. This marble-look quartz is has a soothing white background and delicate veins make for great countertops with waterfalls. 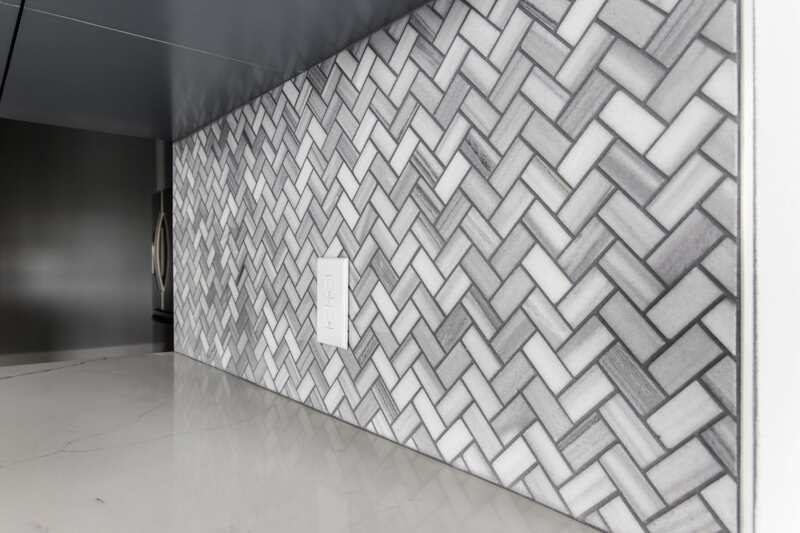 The Backsplash wall tile is a Bergamo Herringbone Mosaic by MSI Surfaces which is an elegant natural beautiful white marble tile that features soft gray tones in the veins. The herringbone design reflects a modern take on a traditional pattern. As seen on Vimeo. 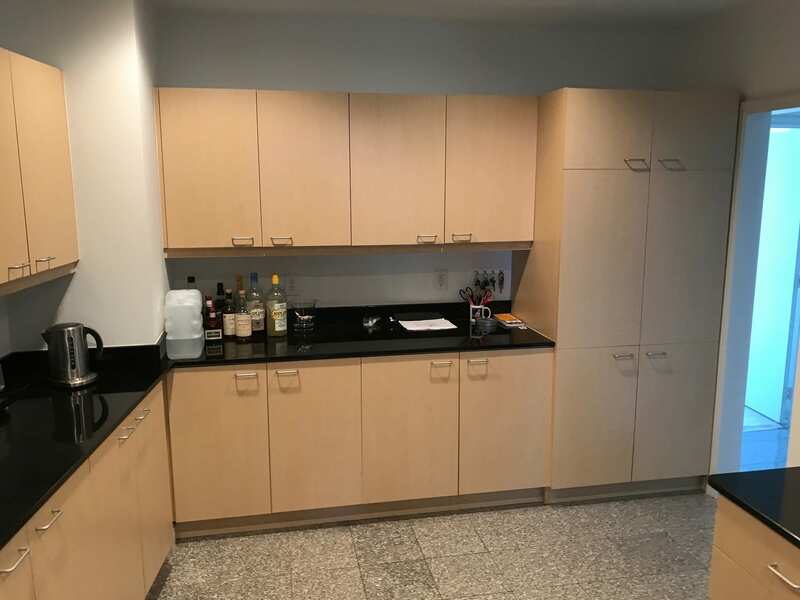 This 2 Bedroom - 2 Bath condo at The Renaissance on Turtle Creek had not been updated and had the same finish dating back to original to the building’s construction in 1998. This traditional palette was not at all what the new owners had in mind for their living space. Their last home was very modern with concrete walls, large stone tile and they wanted to do something similar in the new place. 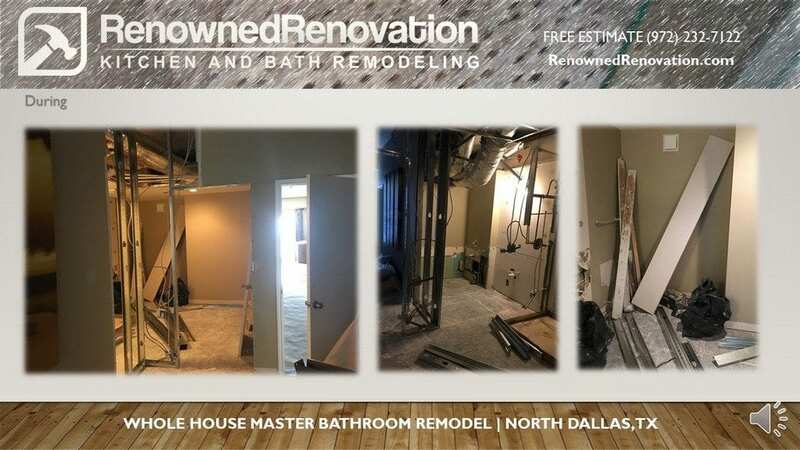 Renowned Renovation removed the existing flooring, master bathroom cabinets, trim, and the master bathroom tub. 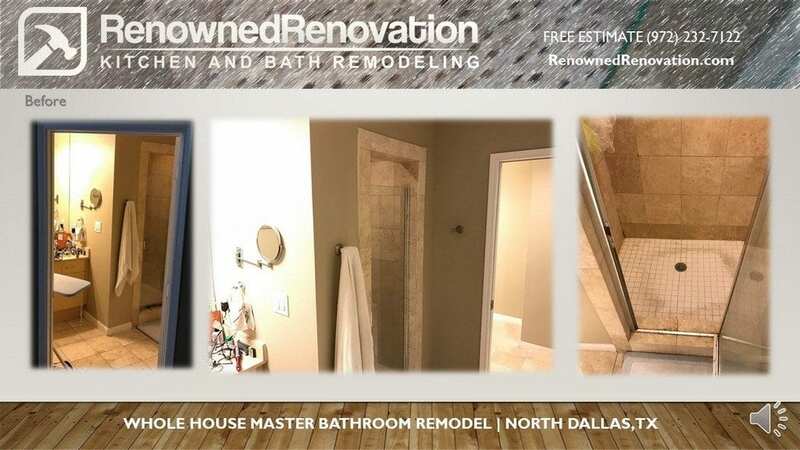 The existing master bathroom had a door allowing guest access from the hallway, which was closed to create a private master bathroom suite with a personal spa. 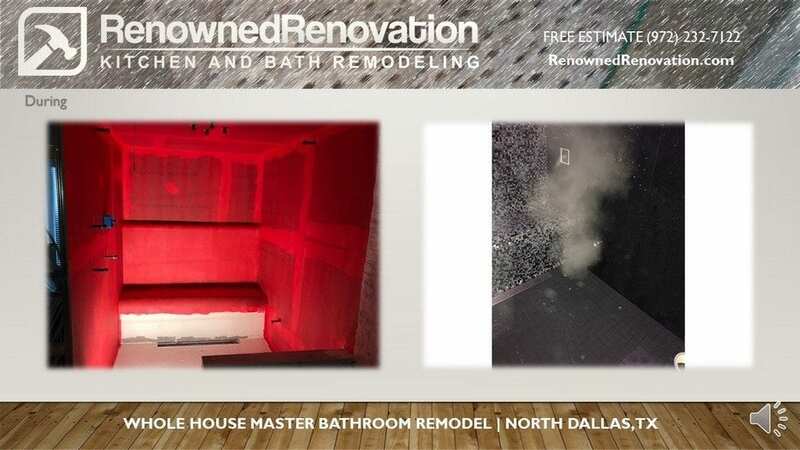 This was accomplished by converting the existing tub into a steam shower. Storage space was maximized in the master bathroom by installing a large custom double vanity with a storage tower. The Bathroom features the next generation of Mirror and Lighting integration from Paris Mirror. This 70x32 inch backlit rectangle mirror eliminates the need for wall lighting usually found above traditional mirrors. 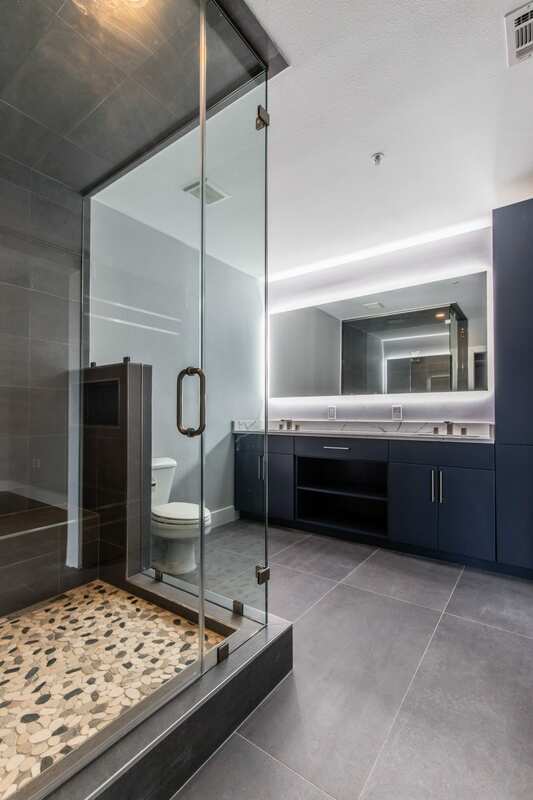 The LED mirror creates a clean - modern look in this condo’s bathroom. We installed a Invigoration™ Series Steam Generators with Controls from Kohler that turns the shower into a spa-like experience with steam. This private steam bath is ready in just 60 seconds. With the press of a button, this 5-kilowatt steam generator delivers the purifying benefits of steam, including respiratory relief and cleansing the body of toxins and impurities, to the shower stall. 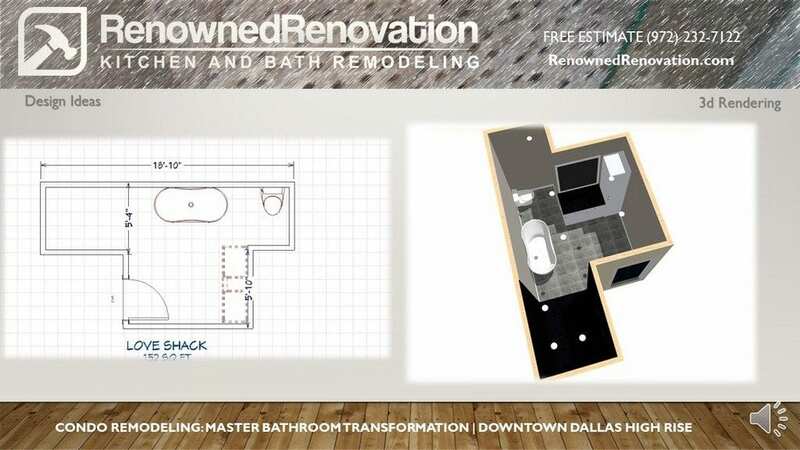 High-rise Dallas Condo Kitchen and Bathroom remodeling project in the Renaissance at Turtle Creek. Budget $45,000. Renowned designed and installed new custom cabinetry to maximize aesthetics, storage, and versatility. New Hunter Douglas Window Fashions and LED lighting were added to feature the floors and furnishings. 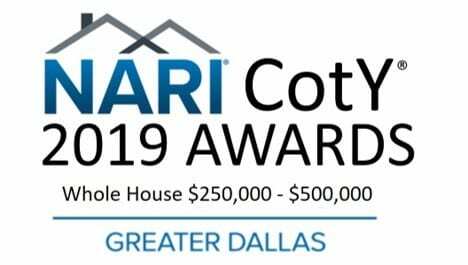 This project was managed by the 2019 NARI award-winning contractor of the Year remodeling team for whole house remodeling project with budgets between $250000 - $50000. 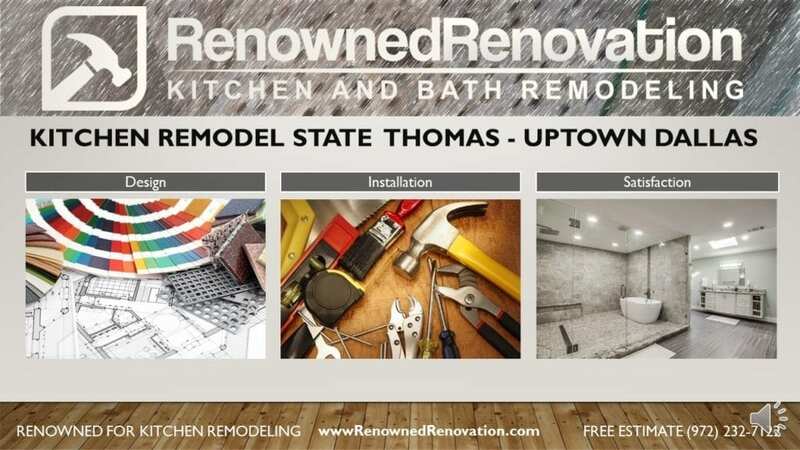 Renowned Renovation specializes in high-quality Kitchen and Bathrooms renovations, Cabinetry and Hunter Douglas Window Fashions. Please call (972) 232- 7122 to schedule a free in-home estimate or an appointment at our Highland Park showroom. 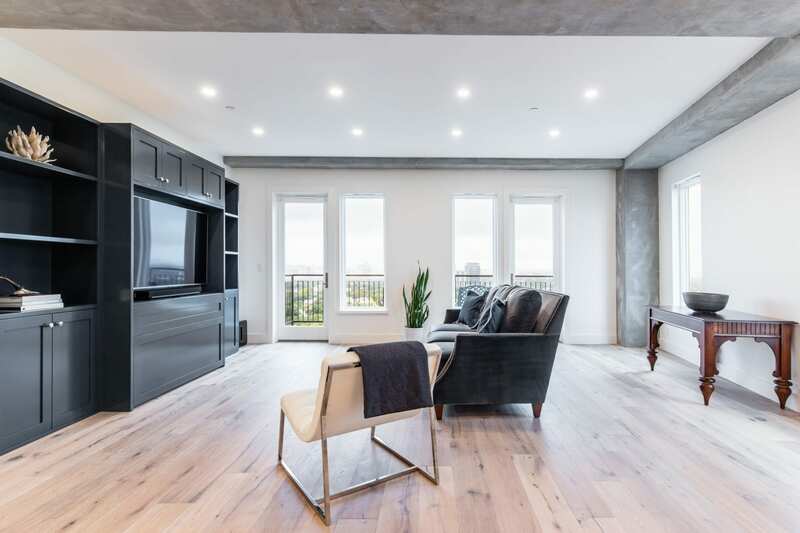 The owners wanted to update this penthouse condo to have an open floor plan, raised ceilings, new kitchen, new bathrooms with tile floors, new hardwood floors throughout the entire home and lots of storage space. 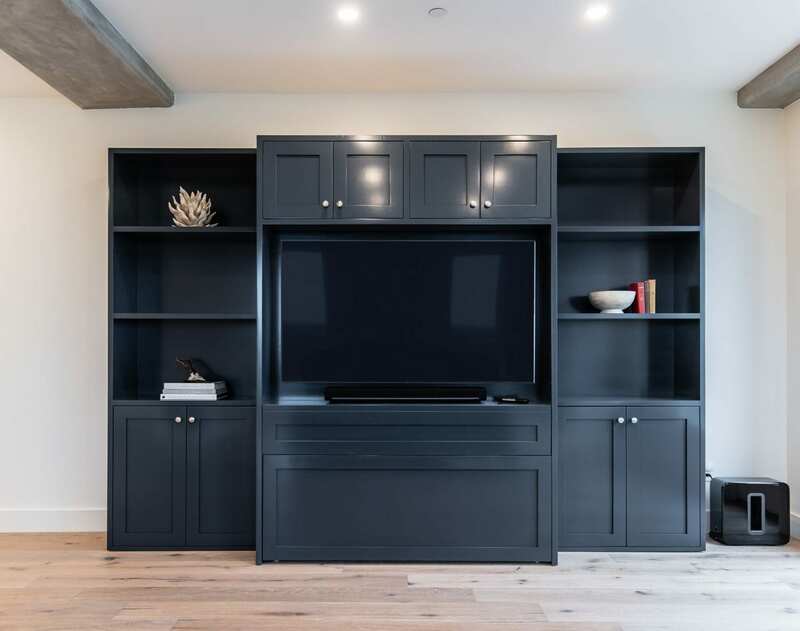 Renowned Cabinetry custom designed all the cabinets including the entertainment center that converts the living room into a guest room with the push of a button the Zoom-Room Remote Control. 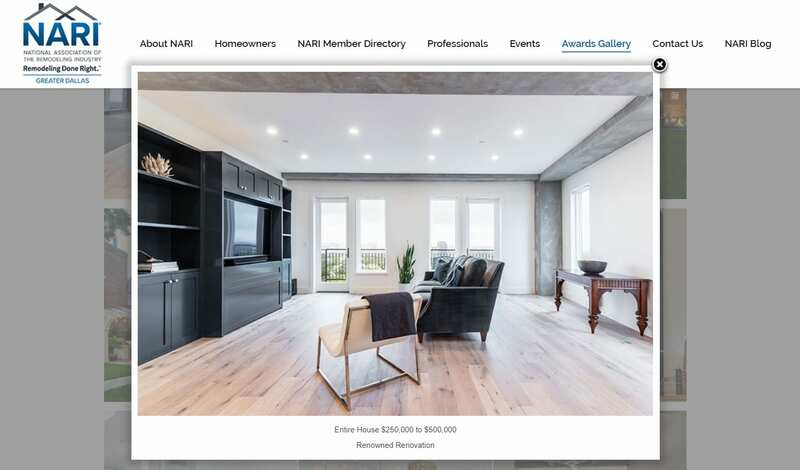 This NARI award-winning remodeling project involved innovative use of materials: Exposed Concrete Beams/Columns, Waterfall Countertops, Floating Shelves matched to the Hardwood Flooring, multiple flooring transitions, intricate Tile Work, and Custom Cabinetry. The finished home features Cambria Surfaces, DuChateau Hardwoods, fixtures by WaterWorks, TruStile Doors, Hunter Douglas Window Fashions, Zoom-Room, and Renowned Custom Cabinetry. Renowned specializes in high-quality Kitchen and Bathrooms renovations, Cabinetry and Hunter Douglas Window Fashions. 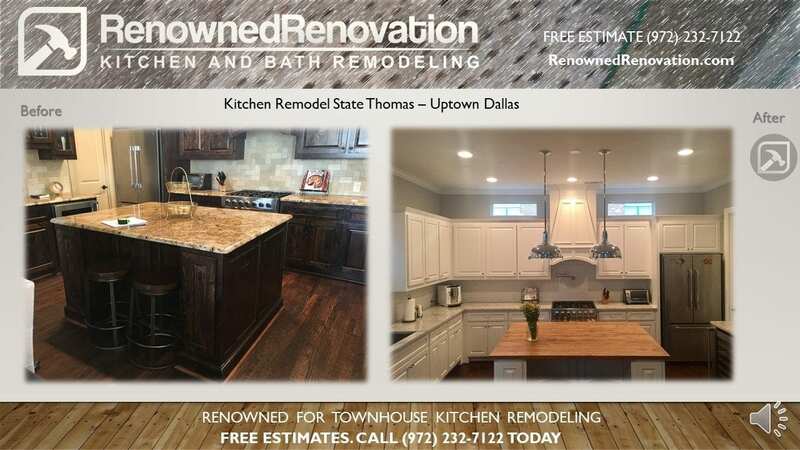 Please call to schedule a free in-home estimate or an appointment at our Highland Park showroom or email info@RenownedRenovation.com for more information. The floors are DuChâteau's The Riverstone Collection™, which is an evolution of hand-sculpted hardwood flooring that blends beautifully with interiors old and new. The natural distressing and raised knots give the floors a raw and organic contour that feels comforting beneath the feet. The DuChâteau®, The Riverstone Collection™ effortlessly merges modern and rustic design to create a truly original and inspiring floor. The owners wanted to update their condo with an open floor plan, raised ceilings, new kitchen, new bathrooms and tile floors, and a new multi-use living room with hardwood floors. The client engaged SHM Architects to take their vision, design a new layout, and create the permit-ready plans . Working closely with the owners, the city, the Homeowners Association (HOA) and the property management team Renowned Renovation ensured all the plans, permits, and work complied with rules and regulations to deliver a well-built home with meticulous detailing and high-end materials. Our project management app, BuilderTrend keep everyone in the loop and help create little or no stress for the owners. We completed the condo remodeling project on schedule and in the budget. In compliance with the Condo HOA rules, remodeling work could only occur on weekdays, between 9 o’clock in the morning and 5 o’clock in the evenings. Everything that had to be removed or installed had to be scheduled and highly coordinated because there were limited street-only parking and there was no storage area. Everything had to be moved in and out using a 6′-by-6′ elevator 15 stories each way. We took many elevator rides during this high rise condo remodeling project on schedule and in the budget. In compliance with the Condo HOA rules, remodeling work could only occur on weekdays, between 9 o’clock in the morning and 5 o’clock in the evenings. Everything that had to be removed or installed had to be scheduled and highly coordinated because there were limited street-only parking and there was no storage area. Everything had to be moved in and out using a 6′-by-6′ elevator 15 stories each way. We took many elevator rides during this high rise condo remodeling project! One challenging element of remodeling this high-rise condo was that the owners wanted to raise the ceilings as high as was possible which required that we replace most of the legacy wiring, fixtures, and the air conditioner ducts needed for the new HVAC system to effectively heat and cool the home. One challenge we discovered after the demo was to achieve the open kitchen concept it was necessary to move a roof drain.To obtain approval we needed an engineering assessment, code compliance expert, variance from the City of Dallas, approval from the HOA, coordination with HOA’s roofers, coring a new hole in the roof deck, and finally plumbing the new roof drain location. 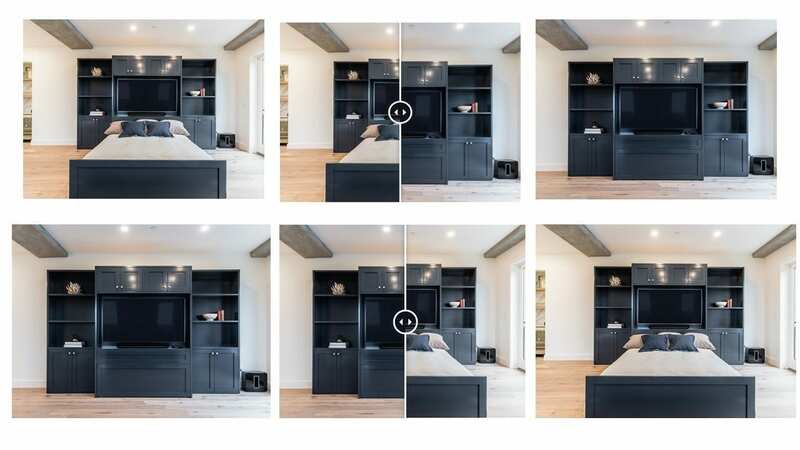 The owners’ selection of materials, fixtures, appliances, furniture-grade custom cabinets, and the remote-controlled hideaway Murphy bed reflected their desire for function, luxury, durability, and style. In compliance with the Condo HOA rules, remodeling work could only occur on weekdays, between 9 o’clock in the morning and 5 o’clock in the evenings. Everything that had to be removed or installed had to be scheduled and highly coordinated because there were limited street-only parking and there was no storage area. Everything had to be moved in and out using a 6′-by-6′ elevator 15 stories each way. We took many elevator rides during this high rise condo remodeling project ! 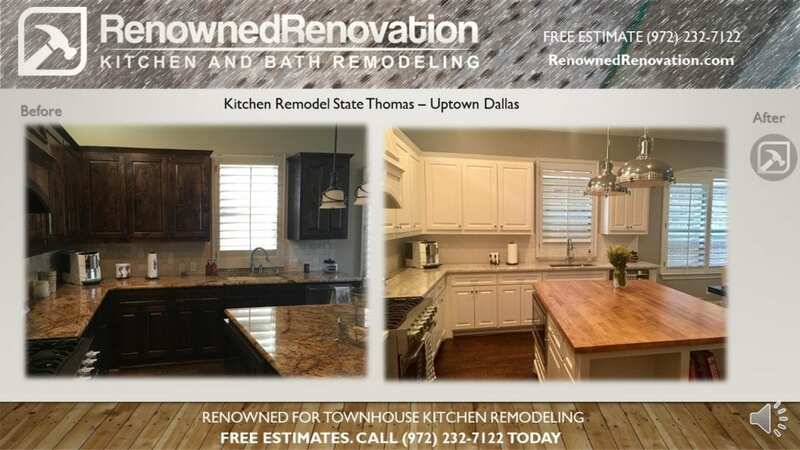 The owners of this beautiful 4 story corner unit town-home in the State Thomas Area in Uptown Dallas wanted to update their townhouse kitchen with new counter-tops, wood floors and painted. Renowned Renovation replaced the old counter-tops, sinks, lights, and backsplash. Prepped , primed, and painted cabinets. Fabricated and installed Butcher Block Counter for Island. Installed new finished oak hardwood floors to match existing. 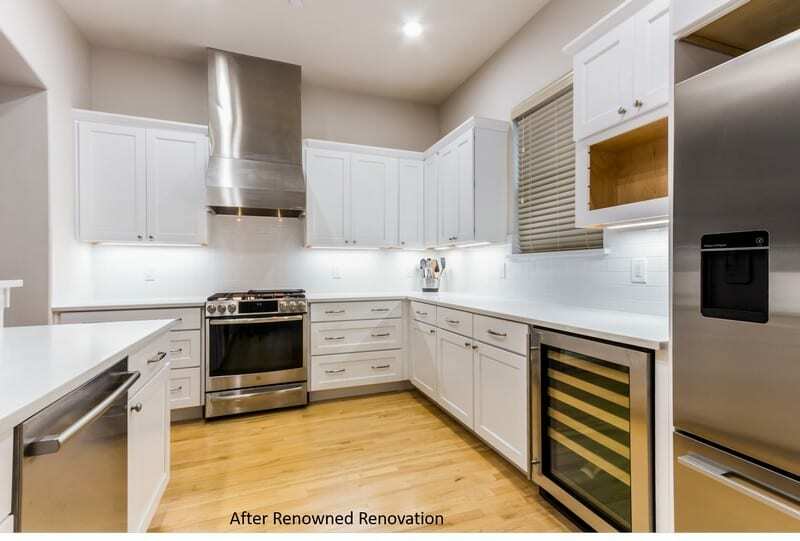 I love my new kitchen and I would hire Renowned Renovation again. 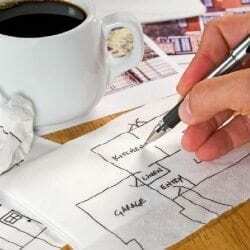 I highly recommend them for your interior remodeling project. Why? 1) Excellent work, 2)Punctual, 3) Good Communication, 4) Reasonable Price, 5) Cleaned-up Afterwards, 6) Considerate of my Neighbors, 7) Followed HOA Rules, 8) Stand-by Their Work." 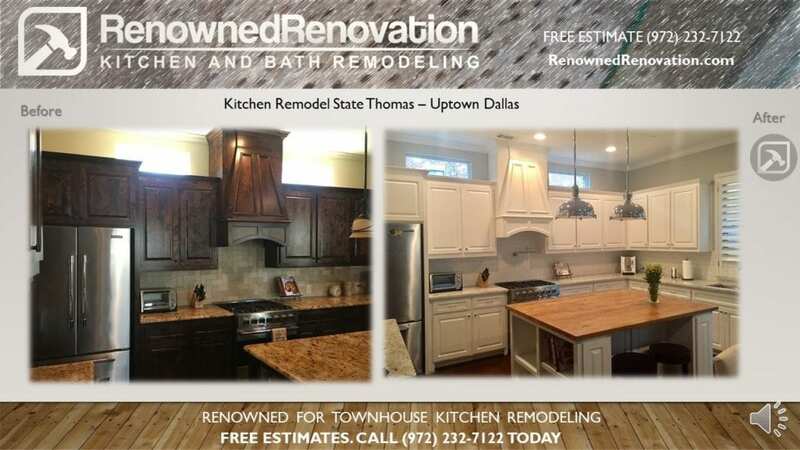 I wanted to remodel the kitchen in our State Thomas District townhouse in the Uptown Dallas area. 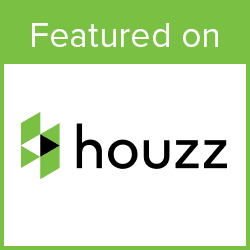 Through search I found Renowned Renovation along with 2 or 3 other contractors on HomeAdvisor.com and Houzz.com. They were very professional setting up an appointment for a free in-home estimate. They showed up at the designated time and provided me with a estimate quickly. I had a “vision” in mind and Tyler and Michael made many design suggestions that I hadn’t considered and really added to the overall results. I greatly appreciated their input. 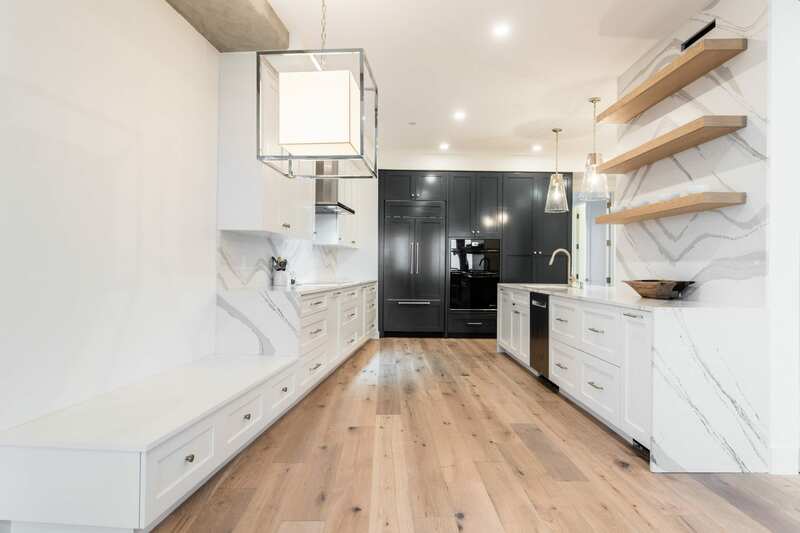 Although the price was a little more than the others, I chose Renowned Renovation for my kitchen remodeling project after careful consideration of all the proposals I received. 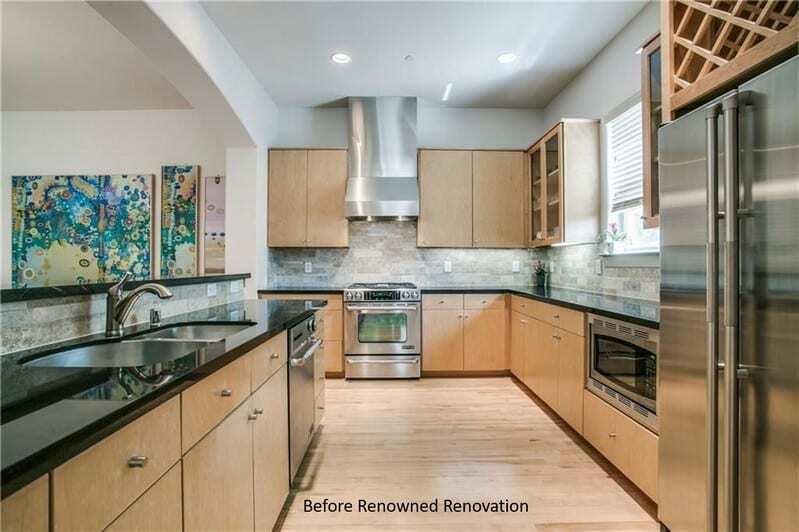 Key among the deciding factors were Renowned Renovation’s reviews, ratings and “before-and-after” pictures. Tyler was the Supervisor fro my project and my daily contact person. He was great to work with, particularly considering the fact that he had to work around a furnished home and my travel schedule. I had a little bit of a problem with a painting sub-contractor but Tyler and his crew took care of everything. 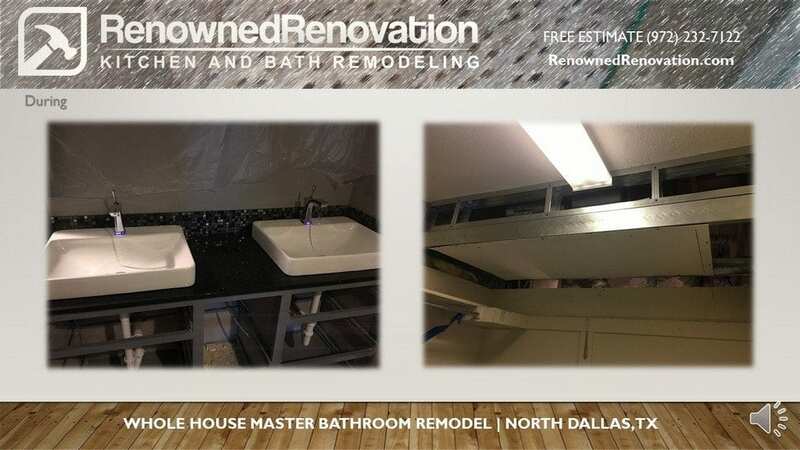 Renowned Renovations did a total master bathroom remodel project for me and it tuned out so much better than I thought it could. Grant and Michael are great to work with, they are responsive and helped with every aspect of the project. They met several times in the beginning to walk through and plan my project, the estimate was up front and no changes or surprises were made during the project and at end they walked through to make sure all the small details were taken care of. Several things brought me to rate them 5 stars, first was the skill of the people they choose to contract with. The tile guys, painters and plumbers really took honest pride in their work and detail and I could tell they were as invested in having a nicely done project as I was. 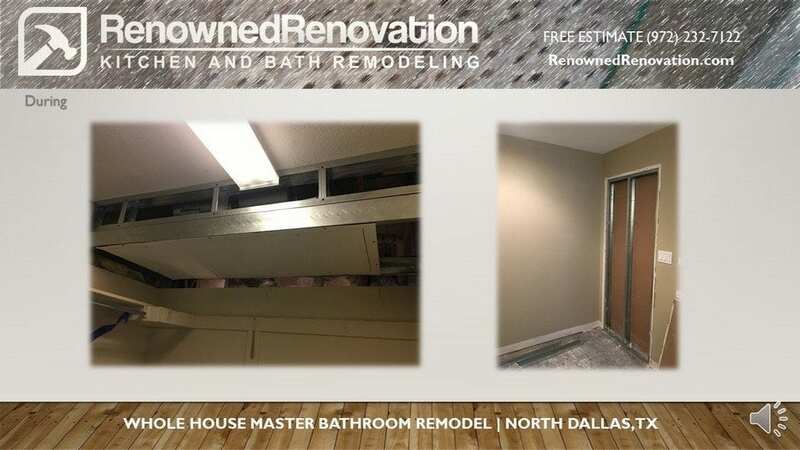 Second was their flexibility, this was my first experience with a remodel and they worked with me on every change I wanted to make, even when some of the original job was already done for example the tile floor for the shower and the paint color which I changed several times. I am having them do 2 more remodel jobs in my home which is the biggest compliment I could give. The plumbing company sent the wrong faucet to my home for the plumbers to install and despite it being installed they took care of getting it done right and changed it out which required re-cutting into the thole they just finished and didn't charge me at all. To the finish of the project they continued to finalize all the small details to make sure I was happy with the work and the design. The owner of this luxury The Travis high-rise condo in the heart of the popular Knox District neighborhood wanted to update his master bathroom and transform it into his own personal spa, We designed a room designed to intensify the daily shower experience with a steam shower, chromatherapy and multiple showerheads that provide a relaxing steam with a massage like a soft summer rain or a Swedish masseuse on steroids. 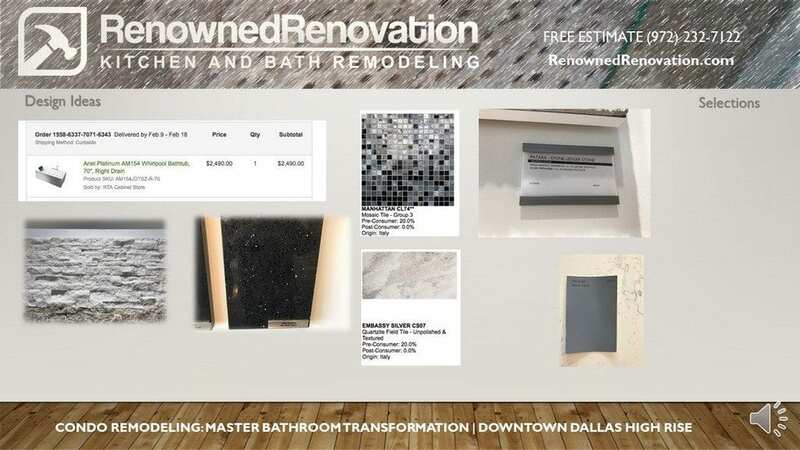 We managed the client’s project using our Interior Remodeling ​Platform powered by BuilderTrend that allowed us to communicate and collaborate on design, selections, budgets, change orders, calendar and to-do lists. I am having them do 2 more remodel jobs in my home which is the biggest compliment I could give. The plumbing company sent the wrong faucet to my home for the plumbers to install and despite it being installed they took care of getting it done right and changed it out which required re-cutting into the thole they just finished and didn’t charge me at all. To the finish of the project they continued to finalize all the small details to make sure I was happy with the work and the design. For your free consultation call (972) 232-7122, visit our online booking page or our contact page. Thinking about remodeling your condominium? Read this first! 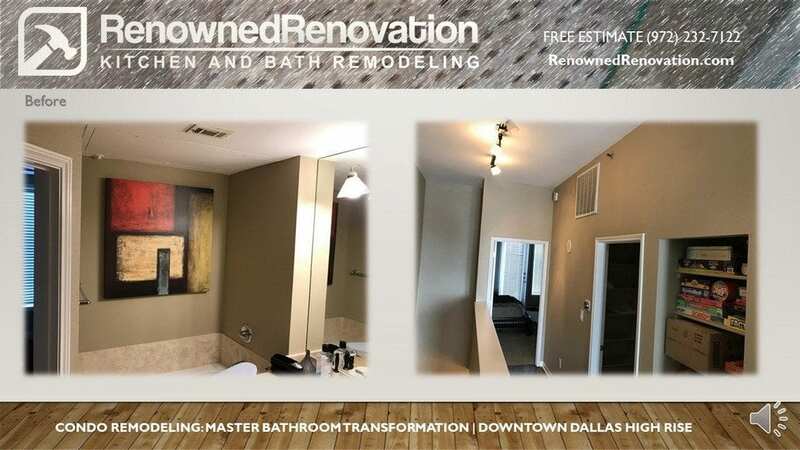 DallasVoice.com interview with the founder of Renowned Renovation – Grant Woodruf, on the do’s and don’ts when in comes to condo remodeling. The process of renovating a kitchen or bathroom can be intimidating. Where to start? What factors do you want to take into consideration? Should you really paint those Shaker cabinets purple? The struggle gets even more real when you’re taking on a renovation at a condo, high-rise or other multi-family residence — there are usually unforeseen restrictions, extra costs and that grouchy HOA president to deal with. Great Spaces Logo bugThat doesn’t mean, however, that you can’t get a killer new kitchen or the bathroom of your dreams just because you don’t live in a house. You just have to get off on the right foot and minimalize surprises (and costs). Ben Trager, specializes in condo/town homes redos and suggests a few things to consider for a successful remodel. He notes that it’s not that hard to get a contracting license in Dallas, so it’s easy to fall prey to someone who doesn’t really have the chops to deliver. Don’t be afraid to take some pre-emptive steps to make sure your contractor is fully qualified. “Ask them, ‘Do you have reviews online? Can you provide a copy of your certificate of insurance? The names and email address of three references? The size, scope and completion date of three projects?” says Woodruff. Consider condo conundrums. Units in multi-family buildings are harder to renovate, which leads to extra challenges… and extra costs. Makes sure you work with your contractor to communicate with your HOA and condo board to answer questions and understand regulations. “In a condo, your wires and your plumbing run through a wall you don’t own. You can only work from 9 a.m. to 4 p.m. You may only have water shut off once a month,” Woodruff notes. The right expert plumber in Sydney will work with you and your HOA to reduce unforeseen issues. Be willing to compromise. New shower! Subway tile! Top-end finishes! It’s all so exciting! This article appeared in the Dallas Voice print edition April 21, 2017. 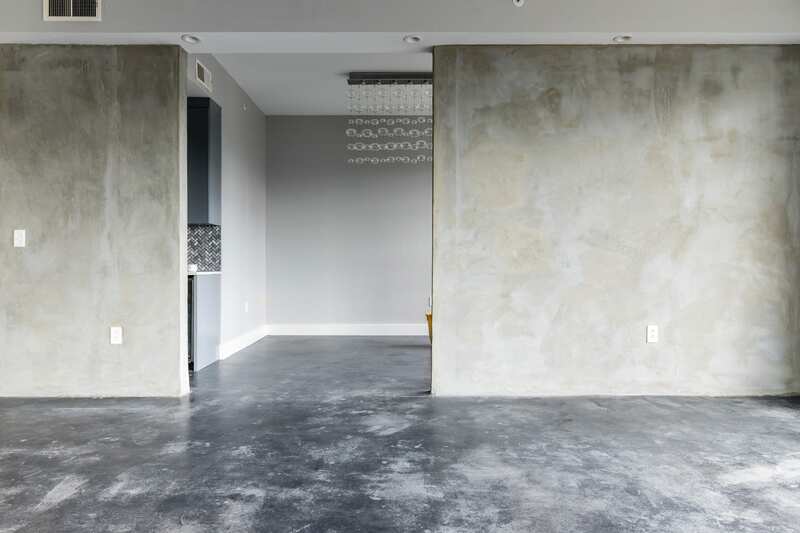 Condo Owners: Read This Before You Remodel! Congratulations on being a condo owner. Your king of your condo castle. Until you try to remodel it. 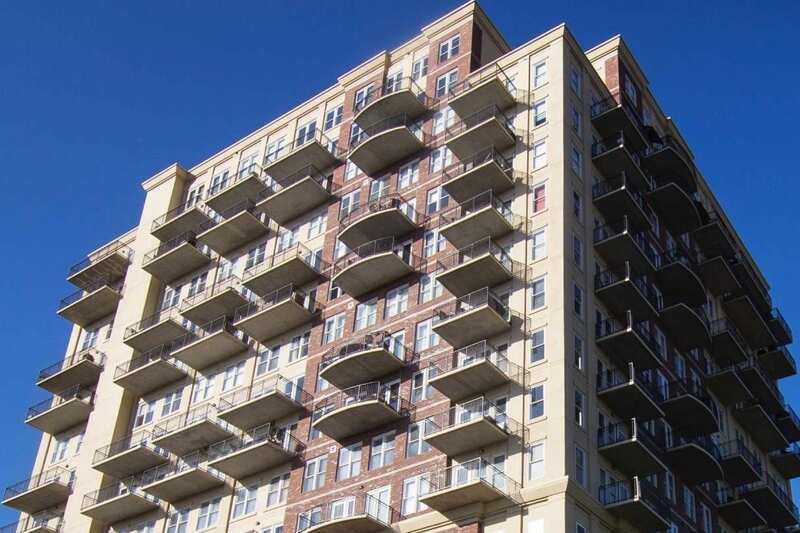 Condominium Owner Associations’ have control over the types of alterations that can be made, who can make them, and the materials that can be used. If you don’t follow their rules, you could be forced to undo the work. Or worse. As an owner of a condo, your own 2 types of property. Property that you own, it’s in your name, and you’re responsible for. In a condo that depends on the declaration but typically includes everything from the sheet-rock in. other property that you own is called common element and includes roof, electrical, wiring, plumbing, front doors, windows, sub-floor/slab, and framing/structural members. Again, this is all dependent on your declaration. Considering your property is within the confines of an Associations’ guidelines, they too, have a certain responsibilities and say over what happens in, around and within your condominium. As a condo owner, you have to walk a fine line of what you want to do with your home and what you’re allowed to do. Luckily for you the pros at Renowned Renovation understand how to ask the right questions and coordinate with management and Board of Directors on your behalf. Working with home owner associations or the property management companies they hire can seem to be slow and annoying. 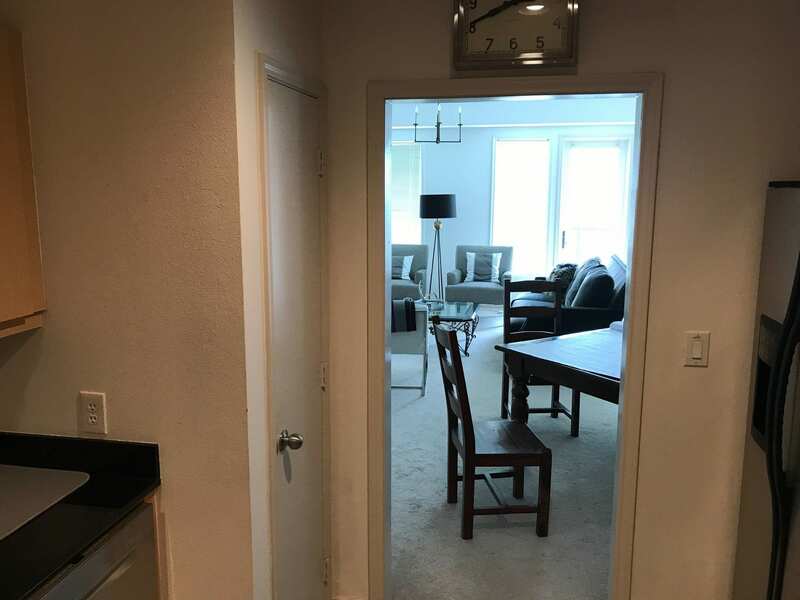 You may be tempted to just say “I own this condo and I’ll do what I want with it!” Please don’t be a condo owner who remodels a bathroom or kitchen only to have the HOA or Condominium Association find out and demand an inspection. • Get a copy of your condo’s status certificate and read it thoroughly. The certificate has all the rules governing your condo, including whether special permissions are needed, what can be altered in the unit (your condo) and what the common elements are. Common elements are the parts of the condo taken care of by the condo corporation (often things like front doors, windows, balconies, plumping, electrical, even AC and heating units in some cases) and these most often have to be left as-is. • Ask questions in writing. Status certificates are often written by lawyers – so it’s not unusual for certain things to appear less than clear. If you have questions about what’s allowed or what you need permissions for, ask your condo owners association or management company…preferably by e-mail. • Consider a contractor like Renowned Renovation with condo experience. Why? Many have rules about when construction work can be done, and these times are often limited to 9 – 5 on weekdays only. These hours are designed to minimize the impact on your neighbors, If you have a job, maybe you can get the time off to complete your project during the day, but chances are, you’ll need to hire someone. Look for professionals who understand the constraints normally in place with condos. 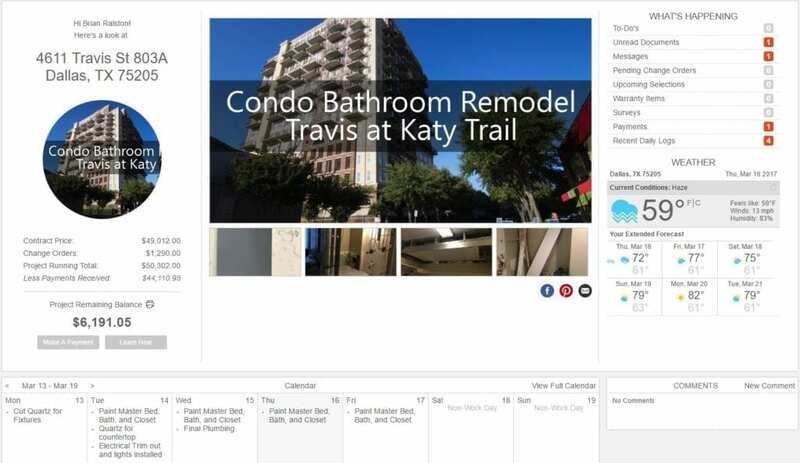 Ask for a list of condo owners we have worked with in Dallas. We can also provide references from condo owners association and condominium property managers. • Your Association and/or its management will require you submit all your plans and confirm them with the appropriate parties. There are certain things – like knocking down a wall, altering plumbing, electrical, or coring in post tension slabs – that will absolutely require proper planning and permissions. Other things will depend on what’s in your status certificate. If you’re unsure, ask – and if you need to, share your plans in writing and get the formal approvals you need before you begin. Be sure to investigate whether mid-job inspections by the condo association are required. These are the things that a professional condo remodeling company like Renowned Renovation will handle for you. We will make all the arrangements with on-site staff. We like to start off on the right foot by properly booking parking (if available), the freight elevator for materials (if available) and giving your condo’s security, doormen, or other staff a heads up on who is going to be coming and going from your unit. If your renovation involves access to the building’s main electrical or plumbing system, we make all those arrangements ahead of time. We make sure workers are in-the-know. Since you won’t be around to hover over the work, we make sure the people doing the renovations firmly understand the rules (like when quitting time is) and what to do in an emergency. Congratulations on being a condo owner. You’r the king of your condo castle.